If you haven't yet heard of UK-based fashion brand Rixo London, then today is the day. The label, which was founded two years ago by former ASOS buyers Henrietta Rix and Orlagh McCloskey, features a print-packed, vintage-inspired collection of dresses, blouses, and skirts. 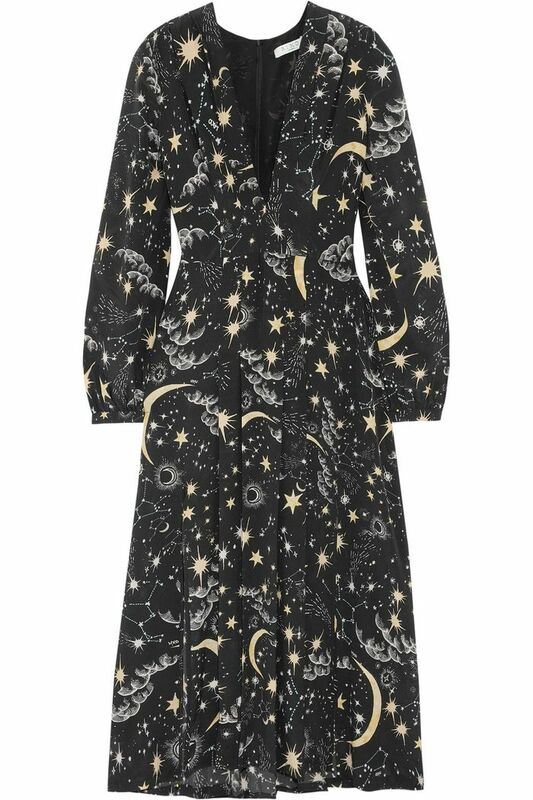 And while the London-based brand started selling on Net-a-Porter last year, there's a new capsule collection of stunning, celestial pieces launching this month that we guarantee you will be over the moon for. Exclusive to Net-a-Porter, the latest Rixo London capsule is "inspired by star-studded evenings at the legendary New York club Studio '54 and the set that partied there." Think a silk crepe de chine midi dress with a hand-painted crescent moon and stars print, or a pleated midi skirt made from the same light and flowy fabric as the dress. Dreamy, indeed. So if you love vintage fashion (the designers scour flea markets to find inspiration for their pieces) and have been wanting to update your wardrobe with a few timeless staples, what better way than with Rixo London's fun, printed pieces. You can thank us later. Scroll down to shop four of our favorite pieces sold exclusively on Net-a-Porter from Rixo London's new capsule collection. Next up, see which look Chrissy Teigen says is her best outfit ever.